Presenting Cormoran Strike #2 The Silkworm by Robert Galbraith (aka J.K. Rowling). A compulsively readable crime novel with twists at every turn,The Silkworm is the second in the highly acclaimed series featuring Cormoran Strike and his determined young assistant Robin Ellacott. A missing husband. A dubiously libellous book. Its less than famous author and his less than fortcoming literary circle. Solving the Lula Landry case, afforded Cormoran Strike much success and a pool of rich clients vying for his services to tail their lovers/better halves. When chance comes in the name of Leonara Quine, looking for assitance in the return of a wayward husband, what appears a simple case turns out to be much more intrinsic and of mysterious proportions. Cormoran Strike and sidekick Robin Ellacott are back eight months after the Landry case, neck deep yet again in a new case that may have been a spur of the moment decision but turns out to be even more nerve wreaking than what they have dealt with before. 'The Cuckoo Calling' set the corner stones and 'The Silkworm' ploughs on ahead. What started as a missing person case turns into the most curiouser of a murder, with a Hannibal-esque (bizarre) murder of the author and a calculating ruthless murderer on the loose. Rowling is a master. Really to envision an idea and to put it into such perfectly suited words. A compact and complex plot with its many layers. This particular case sets the perfect tone for the suspense and thrill. Everything is there, well ordered and well paced...... Just as unputdownable and attention grabbing as the first book was...... 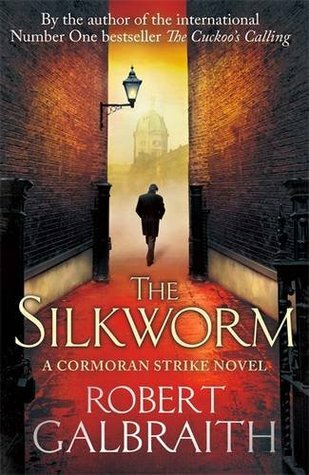 The Silkworm raises the bar considerably higher and I am more than excited to see what new, mysterious case comes knocking on Cormoran Strike's door. "Mysterious, suspicious and maddeningly terrific"